Mizuma Action presents KIMURA Ryoko’s exhibition “Paradise”. In recent years, Kimura came into the spotlight with her solo exhibition at Mizuma & One (Beijing) and various participations to international group shows, making this exhibition a long-awaited event in Japan. Kimura Ryoko was born in Tokyo in 1971 and she graduated from the Tokyo University of the Arts with a Master degree in mural painting. Kimura, trained in oil painting during her studies, had been creating stained glass art inspired by medieval religious imagery untill she seriously took on Japanese painting in 2003. Her folding screen and hanging scroll paintings picture western fantastic figures of princes, Tarzans and mermen dancing in oriental style landscapes. Kimura says being attracted by classic art in which she perceives “a kind of recklessness on the verge of failure that lurks in the loose appearance of even the steadiest of compositions”. Her work sometimes giving the impression of a pointless snapshot of everyday life is always carefully composed after classical precepts and rigorously executed, that being a common trait. The peculiarity of her art also comes from the unique balance between her humorous ambition and the tension of the composition with that “recklessness on the verge of failure”. She draws male figures whose age is always hard to determine between boys and young men. According to her, artworks posing the question of women’s sexual attraction to men are too much absent from art history. She perceives the potential of contemporary Japanese painting in her artistic depiction of the desire of today’s young men for being seen. 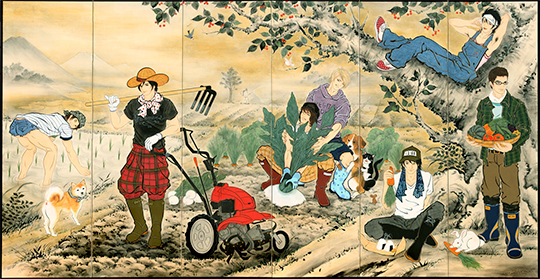 The title of the exhibition is “Paradise”. A new pair of folding screens unconventionally depicts in a dry and dispassionate manner the eroticism of young men that the artist herself secretly enjoys dreaming of. On the other hand, the narcissistic glance and casual poses of the characters bring lightness close to gravure idol pictures with that instinctive power of attraction. We usually don’t pay attention to our reception of their uniform commercial images in our era of information society. Kimura paints their addictive facial expressions –both casual and hard to get away from– with great precision. She searches the essence of the phenomenon arising from her objective and distant approach in her expression of the sexual attraction toward men, a vision mixing both dry and wet perspectives. From a fine art perspective, the unique quality of her work from the way she deliberately pushes her own work “on the verge of failure” is a challenge to both the inheritance and further development of art history. We are pleased to invite you to witness these records of the artist’s battle that blend with the humorous nature of her work.